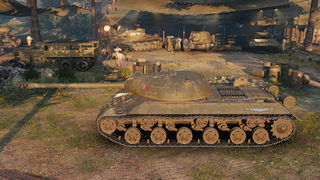 Der IS-3A ist ein sowjetischer premium schwerer Panzer der Stufe 8. Zwischen 1956 und 1957 entwickelte die Akademie der gepanzerten Truppen in einer Projektarbeit ein Ladesystem für die schweren Panzer IS-3 und T-10. Die Variante des IS-3 war mit einem doppelreihigen Munitionslager mit Ladeautomaten ausgestattet. Die Besatzung wurde auf drei verringert: Kommandant, Richtschütze und Fahrer. Der Turm wurde umgebaut, damit der Lademechanismus Platz fand. Das Fahrzeug existierte nur auf dem Blatt. Three man crew limits the potential as a crew trainer. The IS-3A has a weak engine that limits its mobility, especially when trying to climb. As a result it pays to keep the IS-3A on flat terrain, and, if possible, on city streets. The gun, with its reasonable rate of fire and good penetration is an excellent damage dealer (2000 dpm). However, unlike the other Tier 8 Russian heavies, the IS-3A gets HEAT ammunition for its premium ammunition, rather than APCR. This requires more careful target selection to avoid hitting sloped or spaced armour, which, when combined with the gun's poor accuracy, can be a problem. It also means that there is a huge difference in shell velocity between standard and premium rounds (1400 vs 820 m/s), which makes hitting moving targets more difficult. However, the standard ammunition performs so well that it is quite possible to run this tank without loading any premium ammo. In light of the small ammunition load this can be a very attractive option. The IS-3A has good armour, nearly identical to that of the IS-3, including the pike-nosed hull. However, the turret has a different shape, with reduced sloping, particularly when approached form the side. As a result, shots that would ricochet of the side of an IS-3's turret, may penetrate an IS-3A. 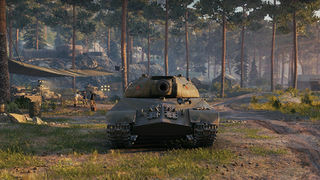 In general, the combination of decent mobility, good all-round armour, and a gun with both high penetration and high alpha damage make this tank relatively easy to play for inexperienced players. The IS-3A's massive damage dealing potential makes this tank ideal for earning credits. Compared to the IS-6, the most common Russian Tier-8 premium, the IS-3A's ammunition is slightly more expensive. However, this is more than off-set by the improved penetration, which means that it is rarely necessary to use premium rounds. 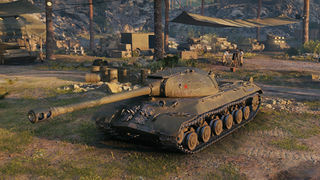 The main down-side of the IS-3A is that its unique crew layout makes it a poor crew-trainer, since none of the Russian heavy tanks have an auto-loader. Both the gunner and commander are considered "loaders" and it may be worthwhile to train safe-stowage on one of them.